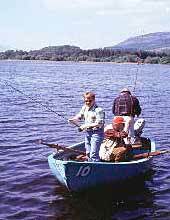 There are many excellent angling locations close to Lenymede bed and breakfast. The following table lists most of them together with information on permits and special features. Access via Forest Drive (10:00 - 18:00) for vehicles or by foot. All year for pike and perch. Tel: 01877 330218 Bank fishing only. Tel : 01877 382 265 No Sunday fishing. Tel : 1877 386 256 Fly fishing only. Boat fishing only - no bank fishing. 3 persons per boat. 2 rods per boat. Tel : 01877 385 664 Advance booking advisable. Tel : 01877 330218 No Sunday fishing. Bank fishing only. No bait fishing. Advance booking advisable. Max. 10 rods per day.